Georgie Balmforth and Claire Collins from St Edmund's Nursery School and Children's Centre in Bradford put together this case study to evaluate the changes for one family following five of our Early Words Together sessions. This case study outlines the results of five Early Words Together sessions for one family. Two-year-old Inaaya lives with her mother Tehseen in Bradford while her Dad is in Pakistan, although they have regular contact with him. Tehseen receives 15 hours of free childcare a week for Inaaya. The resource shares observations and images from the Dear Zoo session in which Inaaya and Tehseen shared the story by Rod Campbell and took part in activities around the book. 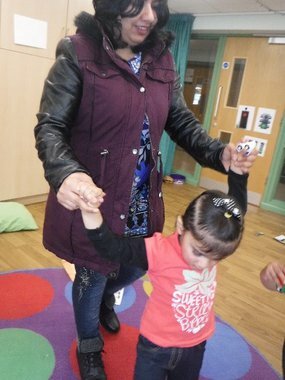 After the sessions the nursery staff noticed a positive change in Inaaya’s interactions - she began to use more words, listen more carefully and grew more confident when getting involved in activities. Her mother Tehseen also became more confident and began to ask the practitioners more questions about her child's learning. Our Early Words Together programme helps parents to support their young child’s literacy and language development. It helps the families that are considered most at need and is proven to increase children’s language development and improve the home learning environment and parental engagement.